1 Owain Ddantgwyn ruled Rhôs and Gwynedd in the last decade of the fifth century. Arthur is said to have flourished at precisely the same time (Historia Brittonum). 2 Owain Ddantgwyn was the youngest son of one of the kings of Gwynedd, Enniaun Yrth, who line were known as the head dragons. Founded by Cunedda Wledig, Gwynedd was almost certainly the most important kingdom of the age, and as borders were extremely fluid it is entirely plausible that the influence of Cunedda's progeny spread into Powys as well as the Gwyneddian sub-kingdoms. (as witnessed in the name 'Cunorix' found at Viroconium). Uther Pendragon - meaning Terrible Head Dragon, was the father of Arthur. Could Enniaun Yrth have been the Yrthyr-pen-dragon? 3 Owain Ddantgwyn, it is theorised, was king of both Gwynedd and Rhôs, succeeding to his brother Cadwallon Lawhir's overlordship (Gwynedd proper) in circa 517 [this theory is not supported by the History Files, as can be noted in the Gwyneddian lists - Ed]. This line of kings thus provided the most powerful rulers in Britain at the time of the Battle of Badon. 'Arthur' led the British to victory in this battle. 4 Owain Ddantgwyn was probably the father of Cuneglasus (Cynglas), whose predecessor was called the Bear. Gildas refers to Cuneglasus as the charioteer of the Bear's stronghold (Din Arth). If Cuneglasus himself were The Bear why does Gildas use the third person? Bear, in its Latin form - Artorius - is almost certainly the origin of the name 'Arthur'. This is quite in keeping in a land recently under the dominion of Rome. 5 At the death of Owain Ddantgwyn, the kingdoms of Gwynedd and Rhôs were again ruled separately by his successors - Maglocunus (Maelgwyn) in Gwynedd and Cuneglasus in Rhôs. It is a distinct possibility that any final internecine battle preceding these accessions would have been fought somewhere on the borderlands between these two kingdoms. In the borderlands of Meirionnydd near Dolgellau lies the valley of Camlan. Arthur's final battle was fought at a site called Camlann. Surely it is more than just mere coincidence that the only locations - three of them - in Great Britain ever known to have been called Camlan are precisely and strategically situated in the border area of the kingdoms of Gwynedd, Meirionnydd and Powys, as they existed in the early sixth century? 6 Owain Ddantgwyn was succeeded (overthrown?) in the kingdom of Gwynedd by his nephew Maelgwyn. David H R Sims presents the case both lucidly and plausibly on the weaknesses of this proposition. He argues that since Owain held Rhôs, his removal would have little bearing on the succession within Gwynedd. However, as stated above the suggestion is that the ruler of Gwynedd, Cadwallon Lawhir, died in circa 517, thus allowing the major kingdom to revert to the suzerainty of Rhôs, and leaving Maelgwn disinherited. Sims argues that if this were the case, there could be no explanation for Maelgwn's failure to also annexe Rhôs following the death of Owain. The fact that he made no such move however, actually supports the Owain theory. One would have expected, in the light of his father's assassination, that Cuneglasus (Cynglas) of Rhôs would have sought reprisals against his father's killer, his cousin. The fact that he didn't, coupled with the fact that he was allowed to keep his kingdom, suggests a certain amount of complicity in his father's death. Perhaps the cousins planned that Owain should die and that the kingdom would be split between them (after all, if Owain was Arthur, High King of Britain, there would have been much jealousy and a prize worth killing for). This provides an equally plausible explanation as to why Maelgwn allowed his cousin to keep the throne of Rhôs. Sims goes on to say "From the dates calculated and the absence of any known ruler between Cadwallon and Maelgwn, it must be surmised that any intervening reign was of some brevity. It is more likely the uncle (a possible unnamed maternal uncle) seized the throne." If control of Gwynedd passed to Rhôs on the death of Cadwallon, then we need look no farther than Owain for an uncle whose reign over Gwynedd was no more than two years. Pretty brief! (Sims bases his theory re: the uncle on Gildas's use of the word 'avunculus' when referring to the deposed uncle). 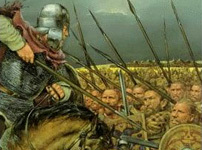 According to the legend, Arthur was mortally wounded at the Battle of Camlann while attempting to quash a revolt led by his nephew, Mordred (Medraut). It seems likely that Mordred may well have been based on Maelgwyn. (For more detail, see my rebuttal of August Hunt's theory below). 7 The Roman city of Viroconium (corresponding with Wroxeter) was fortified in about the same time as the foregoing. An inscription bearing the name of a former king - Cunorix - indicates that the city was occupied by the Cunedda family of the Votadini. The 'CUN' prefix indicates this as indeed the 'RIX' suffix is a variant of -'REX' (King). The inscription - Cunorix macus Maquicoline (King Cuno, son of Maquicoline[?] -this last name is damaged) The stone has been dated to circa AD 480, indicating that Viroconium was flourishing in the time of Arthur. Other evidence dates the abandonment of Viroconium to circa AD 520 - an entirely plausible date for the battle of Camlan(n). The evidence points to Viroconium as the capital of ancient Powys. Archaeology proves that the city reassumed considerable importance during the last years of imperial rule, and was massively reorganised shortly after the Roman withdrawal. 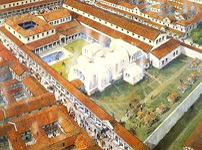 As no archaeological evidence has yet been discovered to support the fifth century rebuilding and fortifying of other major cities, such as London, Lincoln or York, it is a distinct possibility that Viroconium could have been the national capital at this time. This mysterious transformation of a post-Roman city tallies precisely with the time of Vortigern himself - founder of the Kingdom of Powys (according to The Pillar of Eliseg in Llangollen, dated to 850). Bearing in mind the importance of Owain Ddantgwyn, and the fact that many of the borders of Dark Age kingdoms were often in a fairly fluid state, it does not require too great a leap of faith to propose that Viroconium may have been his power base also. Camelot perhaps? Images and text copyright © Mick Baker. An original feature for the History Files.